The last few days I've been finding that certain keys have been prone to outputting double characters. It seems to be the space key (MOOO) and certain other keys that involve that key, like c (MROO). This Twiddler is 6-12 months old with about 3-hours of daily use and my previous one got stiffer instead of more sensitive. I'm wondering if this is normal or if perhaps it comes from space being an 'anchor' key. I use a modified Backspice (from early 2015), which shouldn't really be part of the issue, but it gives an idea of what keys are going to be affected and how often the key is used. On a slightly different note, if this gets worse what's the outlook for warranty in this situation? I'm seeing the same type of duplicates on and off. Last time I saw them was on 10/15/2017. Before that it was on 7/6/2017. Really weird why they come and go so rarely. My Twiddler was purchased on 11/27/2015 and I use it 8+ hours a week daily. BTW, I have been using firmware u12 last several months and today switched to u15. I'm going to pay extra attention to duplicates and will post here if I notice them. Hmm.. i've actually experienced the same issue sporadically. I ended up just buying another Twiddler. The problem has actually largely gone away with the first one, but I'm also not using it as much. I was also experiencing it on the exact same (M000) key, with Backspice. I looked it up and I bought this one March 1, 2017, so I would hope it would last longer. It seems to be outputs that involve the MOOO button (MR00, ML00, MLMM, etc). It's not constant, but RRMO for paste has also given me triple output three times today. Maybe I'll try rolling back the firmware to 12u, since it sounds like AlexBravo wasn't having issues on that firmware. Any updates on this? Did rolling back firmware, or updating it help at all? Thanks! @reedspool if you have only one button that causes this problem, I'm afraid I have a bad news for you: the physical button is bad. I'm having the same problem right now with OROO ("i" in Backspice) button. The firmware downgrade to u12 maybe helps, but does not solve this problem. Oh nooo! Well thank you for the confirmation (and yes, LOOO!). I guess it's time to get a second one and put this one in the backup box. Wishing there was a way to pop out the key and look at the contact or something. Go to a silent place and try to hear how the click of the button sounds. Compare it to the click of another button. Replacing a button is not hard if you know how to solder. How long have you used your Twiddler for? 8ish months I think. Testing it out a little more, it seems that only hitting the top of the button causes this. I wonder if there's some dust/kruft there. Can I safely pop out the button from the exterior with a safety pin or something? Can I safely pop out the button from the exterior with a safety pin or something? There's no way to take the button out from outside. You can try gently tapping the Twiddler on all sides to clear dirt up. 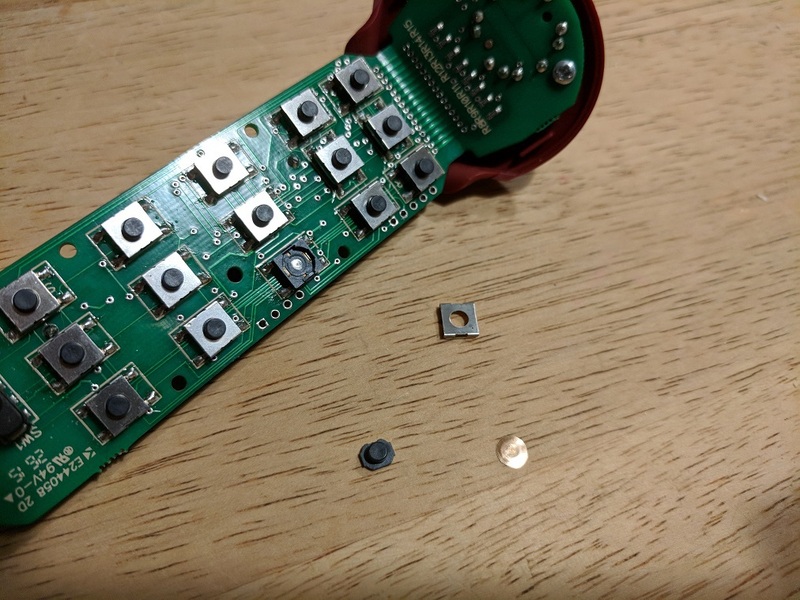 Update: It turns out you don't necessary have to solder anything to fix a button. All you need to do is carefully pop up the lid from a switch and swap a tiny metal disk inside of a switch with a disk either from a new switch or from an unused or less-used switch. I don't use the front mouse buttons, so I swapped disc in "i" and now my 2.5 year old Twiddler as good as new. Hi, I am a relatively new user of the twiddler3 (three days), and after upgrading to v15 firmware, I am basically unable to type any chords because the unmodified keys and/or chords that are subsets of the chord I am aiming for echo before/after the chorded key. This happens on both Bluetooth and USB connections. Should I downgrade to the previous version (the twiddler came with v14.b)? Anything else I can do? I am fairly sure the device is physically alright since all the keys work well un-chorded. Update: downgrading to v14 resolved this issue for me. Can you instruct (or point to instructions) on how to open the case safely? If I am unable to fix mine, is there anyone who would want a half-working Twiddler? I am nomadic so have no reason to keep something I can't use around, and I'd rather it went to a good home. I order my Twiddlers with the back not glued, so I don't know if there's a way to open the case safely. This has started happening to me as well.. I'm getting this on a second twiddler. I'm not sure what makes it happen most, but I think it happens more often in the typing tutor. So maybe slower speeds contribute to it. Actually I'mm getting a lot of double or triplle letters typing work ddocuments. I might have to shelllve the damn thing as it's frustrating to use when I'm constantly editing not just my own mistyping but spontaneous additions made by the Twiddler too. I'll try reverting to 14 firmware in hopes that fixes things if it continues. Last weekend I changed disks inside of 5 more buttons and I have seen only one double output during this week (> 40 hours of usage). Before that change I have seen dozens of double outputs per day. Send it back for repair. These buttons are rated for 1 million key presses. if they are failing before that, we will fix it under warranty. Open a support ticket to get this process started. @tony I believe my buttons are way beyond 1M presses at this point. I was mostly reporting this as a confirmation that this is a hardware and not a firmware issue. I wonder if debouncing algorithm can be adjusted using the older buttons.